Following an incident over the weekend in which Uber defied the New York Taxi Workers Alliance’s hour-long strike in support of Muslim detainees at New York’s JFK airport, people have been deleting the app en masse and switching over to Lyft, a competing company that has pledged $1 million to the ACLU. You should delete Uber. It’s an ethically bad company that mistreats its drivers and riders alike, and CEO Travis Kalanick boasts a working relationship with presidential Neon Demon Donald Trump. But Lyft, too, has its own Trump connections and with it, a history of driver mistreatment. It’s hard to criticize a million dollar donation to the ACLU, an organization that does important brave work and, staring down the barrel of the Trump administration, is more in need of donations than any other time in recent memory. But it’s also critical that consumers see Lyft’s donation for what it really is: a cynical corporate power grab that’s as opportunistic—if not more so—as Uber dropping surge pricing in correlation with a taxi strike. As of its 2016 valuation, Lyft, which—like any thriving tech company—routinely receives hundreds of millions of dollars in investments, was worth $5.5 billion dollars. To them, a $1 million donation is chump change, especially considering the bite Lyft is taking from Uber’s customer base by appearing more liberal. Does that mean the ACLU should reject the donation? Hell no. They should take every last penny and invest it in their continued protection of America’s civil liberties. But does that mean that we, the consumer, should have to buy into Lyft’s con? That, too, is a resounding no. Among Lyft’s major investors are Trump advisors Mary Barra (who, as CEO of GM, invested $500 million in Lyft) and Peter Thiel, founder of PayPal and—more notably for this website, at least—an aggressive anti-First Amendment advocate. In addition to its shameless Instagram spokespeople and conservative investors, Lyft, like Uber, is known for union busting. In fact, the two companies even joined together with the Seattle Chamber of Commerce to sue the city over an ordinance that, according to Dissent magazine, “allows on-demand workers to unionize.” In August of 2016, a federal judge dismissed the case. One of the biggest challenges we face as consumers in 2017 is making ethical choices on how we spend our money. It’s nearly impossible to find a company that hasn’t taken advantage of its workers or its customers (again, even unionized taxi companies have their problems), but there are certainly those that do better than others. Curb, for example, offers all the convenience of a rideshare app, but connects you to professional, trained taxi drivers, many of whom (depending on the city) are unionized. Deleting Uber is an easy way to participate in the resistance against the xenophobic hellscape wrought by the Trump campaign without having to sacrifice much in way of time, energy, and resources. That doesn’t mean the action bad. After all, nothing this day and age sends a stronger message than money (whether we’re giving it or denying it) and we slacktivists got Uber to form a $3 million legal fund for drivers affected by the immigration ban. And then, of course, there’s Lyft’s ACLU donation, which—though undoubtedly motivated by the bottom line—will go on to do very good things. And all of this was accomplished in the span of a weekend, just because some of us deleted our apps. But for those of us who live in areas with multiple transit options, our conscious consumerism should not end there. Let’s not forget that it was the New York Taxi Workers Alliance (NYTWA) that showed real solidarity during the JFK protests this weekend, and not for the sole purpose of commercial gain. They have, with no uncertain terms, spoken against Trump’s disgusting Muslim ban and continually speak out for New York’s immigrant workforce. So rather than switching your alliance from Uber to Lyft or any other rideshare start-up, be smart and promise your brand loyalty to no one. 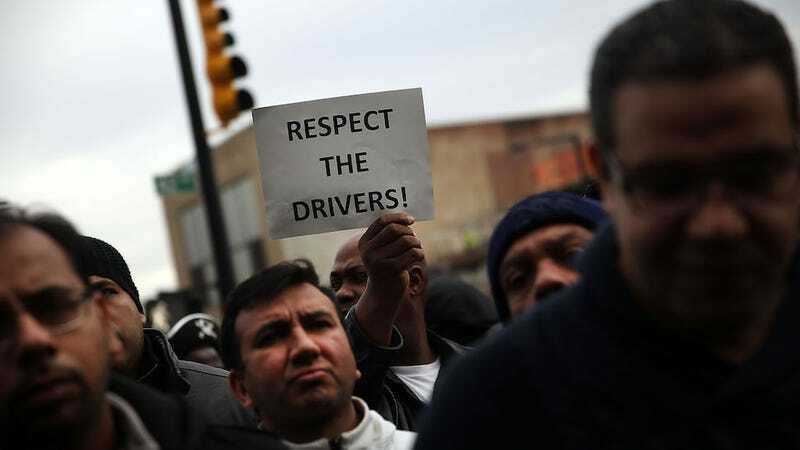 It’s the drivers who deserve your support, whether they work for a rideshare app or a unionized cab company or something in between. No PR boon is worth your unquestioning support. Instead, keep speaking out for drivers’ rights, support the bravery of the NYTWA, and keep fighting for the immigrants that face unconstitutional detainment at our nation’s airports. While you’re at it, do your research and spend your money wisely.